There is no force, fear, pain, or intimidation here. I believe in utilizing choice-based training for all species. These methods do not use fear or intimidation. Instead, they encourage the animal to make better choices. Animals learn more quickly when they are given a choice and they learn on their own, rather than being forced. Knowing how animals learn is vital to any kind of success. Knowing how to humanely encourage appropriate behavior is also important. Applied Behavior Analysis has been shown to be incredibly effective with human learners so the best animal trainers in the world have now adapted this teaching and learning model for animals. Conscious Companion comes from a professional background that uses humane behavior intervention. This type of teaching using positive, least-intrusive solutions. We facilitate learning for all species without force. We engage an animal's incredible capacity to learn by interacting with his/her environment. We know that if we want both people and animals to succeed, we need to change the environment. This method of training is fairly straight forward: Good behavior is rewarded, and unwanted behavior is ignored. Inappropriate behavior is redirected, rather than suppressed. Simply put, rewarding desirable behavior will increase the likelihood of that behavior being repeated. Ignoring undesirable behavior will help to decrease the likelihood of that behavior being repeated. When animals receive a reward (attention, food, or praise) for a particular behavior, they start to make better decisions, and problem behaviors start to take a "back seat". Throw in a dab of creativity, patience, and science, and before you know it, those "problem" behaviors are gone, replaced with better behaviors that keep everyone content and at peace. Isn't All Training the Same? There is a very popular, and misleading philosophy that “training is training". However, modern behavioral science has proven that force-based training (such as physical and emotional punishment in all forms) is psychologically damaging for an animal, and has potentially dangerous consequences for humans. Punishment based training also breaks down the fragile bond between an animal and their human. Fear-based training uses physical and emotional punishment and suppression of behavior. These methods do not allow an animal to make choices. The training I use helps to establish and maintain a connection that increases trust, and therefore creates a stronger bond between an animal and human. Strong bonds create harmony and safety in the home. Training should be based on trust and patience. Building trust, and practicing patience is essential. The strongest relationships between animals and humans are based on cooperation and kindness rather than a human dominance/animal submission methodology. Positive training helps to establish and maintain a connection that increases trust and therefore creates a stronger bond between animal and human. I did not learn all of this overnight. My areas of expertise took decades of determination, science-based learning, and a firm belief in knowing that there had to be a better way to improve how we approached the management of the animal(s) we were caring for in captivity. - A way that did not involve breaking down the bond and creating fear. I learned from first hand experiences that there is not one species on this planet that needs a "heavier" hand. All animals learn the same way, and we can teach them all without force. When I was an animal trainer and an enrichment and husbandry specialist at the world famous Audubon Zoo for over a decade, I was surrounded by peers and supervisors who did not follow the force-free training method. I was the minority, to say the least. But as time and my results would show, the animals that I cared for and performed medical procedures on, became better behaved and healthier after I implemented force-free, choice-based husbandry and training protocols. The lives of the animals and the lives of the zoo staff improved because of my methods. Now, thankfully, these science-base methods are finally being utilized in the pet training community all over the world! Modern science, patience, and compassion are what I base my work upon. We are NOT down with "dominance". Conscious Companion does practice or teach the old school, harmful, and disrespectful dominance-based dog training. In fact, we only utilize and teach choice-based training for all species. "If we can communicate with wild animals and teach them new behaviors without dominating them, why do we need to do this with dogs? With this poster, I hope to inspire pet owners to use humane, force-free training methods that are already being implemented successfully around the world in progressive zoos and aquariums, on important life-saving missions, and wildlife conservation. TRAINING TRUTH: Positive training methods create a safe environment for everyone, and you see results faster, that last longer. The Positives of Positive Reinforcement! Remember how happy you were when your teachers praised you when you did a great job on a paper, or your boss rewarded you with an extra day off for a job well done? Their behavior made you want to do it again, right? That's positive reinforcement! But what does this have to do with the animals in our home? Well, animals don't care about money. They care about praise … and food. So those are the tools we use! Positive reinforcement training uses praise and/or treats to reward an animal for doing something you want them to do. The reward makes it more likely for the animal to repeat the behavior. This makes positive reinforcement one of your most powerful tools for shaping or changing your pet's behavior! Positive reinforcement training becomes a shared experience that leads to a powerful bond of trust and cooperation. When teaching an animal is done without force, the animal is *choosing* to work. The animal becomes a willing and eager participant in the training process! The relationship between animal and human is enhanced with every lesson. "It is an unspoken agreement between animals, fulfilled through action: the teacher takes on the responsibility to teach the animal what to do. The animal then has the opportunity to learn what behavior is rewarding to offer to the human. This interaction is far less stressful and much more enjoyable for both student and teacher." TRAINING TRUTH: The most successful modern training theories have proven that reinforcing good behavior with rewards, while using constructive boundaries and guidance, is a much more successful and long lasting form of training. Positive reinforcement is practiced by giving the animal a reward in the form of praise, play, food, toys, petting, etc. when the animal offers a behavior that you prefer. This type of training allows the animal to make their own decisions, and therefore be an active participant in training (vs. being forced to do something). This has been shown to be the most effective way to train animals and people! ﻿Any animal can be trained using force free methods! Yes, even iguanas can be trained! 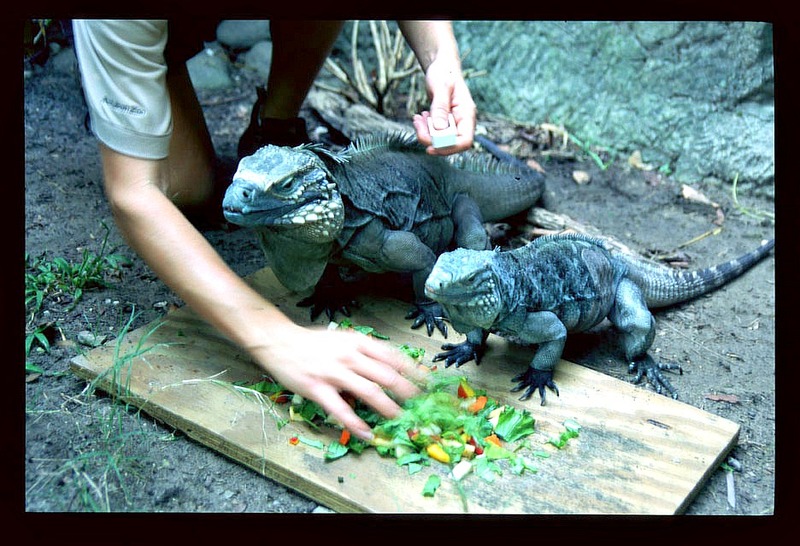 These critically endangered Blue Iguanas were mates at the Audubon Zoo where I worked for over a decade. This image is a snapshot of Blue and Cooper learning manners at meal times through the use of clicker training. By teaching them how to "station" and "wait", I was able to eliminate feeding aggression from the male, and competition over food at meal times. This technique can be used on any species of animal, especially in your own home! "Blue" & "Cooper" at the Audubon Zoo learning how to be calm at feeding time, through the use of clicker training! Training Truth: Positive Training is not a "permissive" form of training. This kind of training doesn't allow the animal (dog, cat, parrot, or pig!) to walk all over you and run amuck. This kind of training provides consequences to all behaviors. The person has the role of being a benevolent leader and guide for the animal. This kind of training uses ethical and scientifically based methods. It's cruelty-free training based on science. What Does “Science Based” Animal Training Mean? 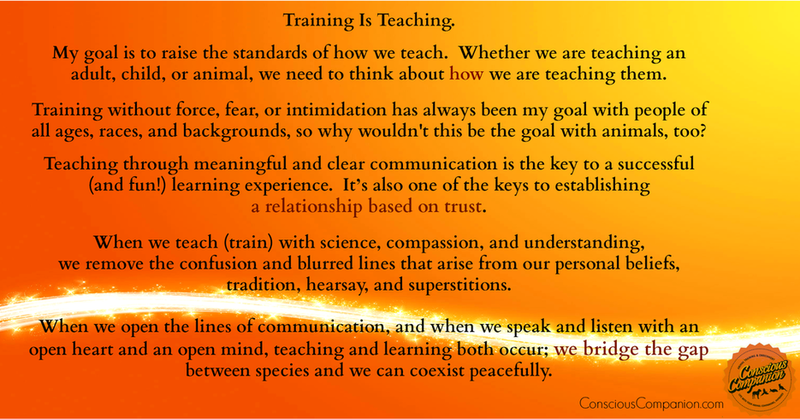 Click on the image to learn exactly what science-based training means. The field of Applied Behavior Analysis has been so effective with humans, which is why I use it as a guideline when teaching animals. The guiding principle of this approach is a hierarchy of teaching interventions: We begin with the most positive, least intrusive behavior solutions. We avoid the most intrusive means (positive punishment). The goal is to set the learner and teacher up to succeed from the get-go. We create an environment that allows for this. We want the animal to learn to make better choices, then reward those choices. But we also want to consider custom-fitting the universal laws of behavior to each individual learner. Everyone succeeds this way! TRAINING TRUTH: There are only two kinds of problem behaviors: those that occur too often, and those that don’t occur often enough. ~ Susan G. Friedman, Ph.D.
Science shows us that we can make more progress by using patience, kindness, and allowing choices - rather than creating fear. Those of us who know and love dogs don't need scientific proof that dogs love us. But the results of a recent study may provide hard evidence that dogs are capable of feeling complex emotions, particularly love and attachment. Emory University neuroscientist Gregory Burns and his colleagues analyzed the results of brain scans on dozens of dogs. This was the first time that scans were able to be completed on dogs that were not under any type of anesthesia. The scientists wanted to study how the dog's brain functions when presented with different stimuli, which would be impossible with an anesthetized dog. The study's findings may not be surprising to many of us, but they certainly affirm the fact that dogs do feel love and attachment towards humans. The study showed that the caudate, the area of the brain in humans that is activated when humans feel love, also activates in dogs when their owner returns after a brief separation. I was asked to respond to the 2014 World Dog Trainers' Motivation Transparency Challenge. 1. What will happen to a dog that I am training if they "get it right"? 2. What will happen if they "get it wrong"? 3. Is there a less invasive way to train dogs than the methods I currently use? ​WHY We Are Answering:​ Let's all be open, honest, and transparent about the techniques we use when training our dogs, and our clients' dogs. Addendum to video: Dogs ARE food motivated, unless the dog is over threshold. In this case, the dog who is refusing food is communicating to us that he/she is too stressed to eat. This often occurs when the dog is too close to a trigger/perceived threat. So in that situation the most humane/least invasive decision would be to remove the dog from the perceived threat. We could then offer the dog another choice (leave/stay, play/food/praise, or all of the above), with the end goal of relieving stress and changing the underlying stressful emotions in the dog. It's our role as the trainer/guardian to ensure the animal is not overwhelmed in any kind of situation.